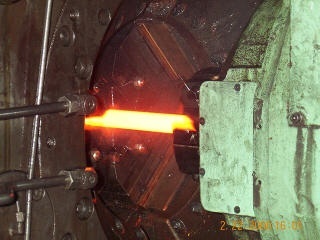 Besides the forging and finishing of bar, we have added two more rolling mills to produce our flat products. The thinnest 6B we have made so far is 16g (0.063" thick). We also make our own 6BH. Flatness has always been key to this product, as it is used for scrapers & knives. Cutting the material on our waterjet is so much easier than when we only had abrasive, plasma and shear capabilities. We've become very adept at nesting for the highest cutting yields possible.